Text copied from: "Genghis Khan & the Mongol COncuests 1190-1400" from Stephen Turnbull by Osprey Publishing, seeSources. In most accounts of the Mongol conquests Genghis Khan's subordinates come over as two-dimensional characters, mounted automatons moving as stereotypically as the myth of Mongol supremacy would always have us believe. Yet in the service of Genghis Khan were many leaders of great military talent who were personalities in their own right. One of them was Subadai Ba'adur, whose name variously appears as Subedei, Sabatai, or Subodei. He was born in about 1176 the son of a blacksmith of the Uriangqadai clan and joined Temuchin's band when he was still a youth in about 1190. Along with his brother, ]elemei, Subadai rose quickly in Mongol service and commanded cavalry at the age of 25. Subadai appears to have been a heavyweight in more ways than one, and had to travel to battles in some form of carriage to spare the backs of the slight Mongol ponies! Subadai is the exemplar of that remarkable and commendable loyalty shown by subordinate generals of the Mongols towards their ruling Khan. ' As felt protects from the wind,' he promised to Genghis Khan, 'so I will ward off your enemies.' His first independent command was in 1205-06 when he successfully pursued and killed Kutu and Chila'un, sons of the defeated Merki leader, Tokhto'a. Subadai commanded a tumen (10,000 men) in the wars against the Xixia, and we read of him being given joint command of the 3,000 Mongols sent in pursuit of the Shah of Khwarazm after the Samarkand operation. When the Shah died in 1221, Subadai was one of the commanders entrusted with the reconnaissance mission 'to the Western lands' that took the Mongols into Russia for the first time. This operation was a remarkable feat that brings great credit upon Subadai. Having destroyed several towns in Azerbaijan, the Mongols were bribed to spare Tabriz, and he and his men wintered in eastern Armenia. In 1221 the two generals defeated King Giorgi the Brilliant of Georgia near Tbilisi. From there they returned to Azerbaijan and were on the point of marching against Baghdad to destroy the Abbasid Caliphate, but instead returned to Georgia, defeating another Georgian army using the tactic of false retreat. They then swung north and advanced into southern Russia and captured Astrakhan. Pushing on across the river Don they penetrated the Crimean peninsula and were in the Ukraine to winter the snows of 1222-23. In 1223 they began to return home, only to be intercepted by an allied enemy force. These were the soldiers Subadai and his colleagues led to their deaths at the battle of the Kalka river. 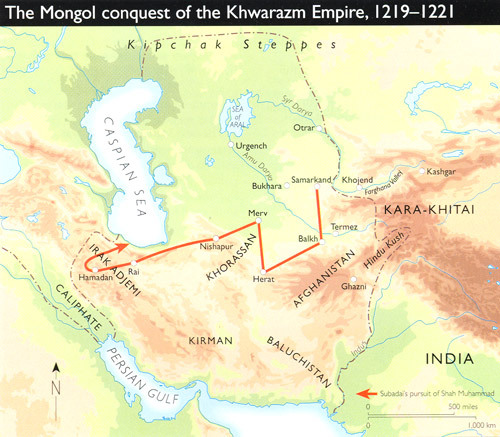 Their earlier conquest of the territory of the Shah of Khwarazm had taken the Mongols as far as the borders of Azerbaijan, at which point Subadai and Jebe asked permission to proceed north and reconnoitre the 'Western lands'. This led to the conquest of Azerbaijan and Georgia, after which they came upon the nomadic Polovtsians, referred to in the chronicles as Kipchaks or Cumans (Kumans). By 1223 the Mongols had completed these operations and regrouped in the southern Russian steppes. The name Tartars or Tatars is the expression often used in Russian source materials for the Mongol hordes. The original Tartars were a rival tribe wiped out by Genghis Khan, but the expression may also derive from Tartarus meaning 'Hell', the supposed origin of these strange warriors who had appeared from nowhere. Map copied from: "Genghis Khan & the Mongol COncuests 1190-1400" from Stephen Turnbull by Osprey Publishing, see Sources. ...his Kuman warriors failed, and retreated in such haste that they galloped over the Russian camp and trampled it underfoot. And there was not time for the Russian forces to form ranks. And so it came to complete confusion, and a terrible slaughter resulted. ...this accursed Ploskyn lied, and he bound the princes hand and feet and turned them over to the Tartars. The princes were taken by the Tartars and crushed beneath platfoms placed over their bodies on top of which the Tartars celebrated their victory banquet. Following the death of ]ebe on the return journey, Subadai successfully led the Mongol army home having covered around 6,500 km (4,000 miles) in less than three years. Subadai may have served in Genghis Khan's last campaign against the Xixia, but the next action for which he is renowned was the successful siege of the ]in's southern capital of Kaifeng in 1232, where Subadai had to contend with thunder crash bombs thrown by catapult. That was the last Subadai was to see of campaigning in China, although in 1257 his son, Uriyangkhadai, led an army into the country now known as Vietnam, and his grandson, Bayan, was to accomplish the destruction of the Southern Song in 1276. 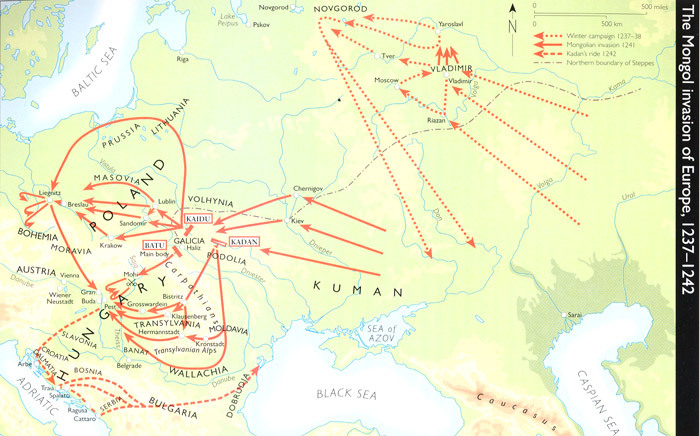 Subadai's last and greatest campaign was the invasion of Russia and eastern Europe, described in detail above. Batu, son of Jochi, was the overall leader, but Subadai was the actual commander in the field, and as such was present in both the northern and southern campaigns against Russia and the Ukraine. He commanded the central column that moved against Hungary. While Kaidu's northern force won the battle of Leignitz and Kadan's army triumphed in Transylvania, Subadai was waiting for them on the Hungarian plain. The newly reunited army then withdrew to the Sajo river where they inflicted the tremendous defeat on King Bela IV at the battle of Mohi. Subadai masterminded the operation, and it was to prove one of his greatest victories. The king had summoned a council of war at Gran, an important settlement on the south of the Danube bend upstream from Buda and Pest. As Batu was advancing on Hungary from the north-east it was decided to concentrate at Pest and then head north- east to confront the Mongol army. When news of the Hungarians' apparent intentions reached the Mongol commanders they slowly withdrew, drawing their enemies on. The Mongols took a stand near Eger to the east of the river Sajo, on a flat plain bounded to the north by the famous wine-growing area of Tokay. It was a strong position. Woodland prevented their ranks from being reconnoitred, while across the river on the plain of Mohi, the Hungarian army appeared to be very exposed. Subadai launched the battle of Mohi during the night of 10-11 Apri11241, only one day after his compatriots had won the great battle of Leignitz. One division crossed the river in secret to advance on the Hungarian camp from the south-east. The main body began to cross the Sajo by the bridge at Mohi. This met with some resistance, so catapults were used to clear the opposite bank. When the crossing was completed the other contingent attacked at the same time. The result was panic, and to ensure that the Hungarians did not fight desperately to the last man the Mongols left an obvious gap in their encirclement. As they had planned, the fleeing Hungarians poured through this opened trap which led to a swampy area. When the Hungarian knights split up, the light Mongol archers picked them off at will and it was later noted that corpses littered the countryside for the space of a two days' journey. Two archbishops and three bishops were killed at the Sajo. By late 1241 Subadai was discussing plans to invade Austria, Italy and Germany, when the news came of the death of Ogodei Khan, and the Mongols withdrew. With his return to Mongolia Subadai's name disappears from history. Perhaps he retired from active service, because we know he was dead by 1248. He remains one of Genghis Khan's most celebrated generals, and there is a statue of him in Ulan Bator, honouring a fine soldier and a loyal and honourable follower of the Mongol Khans.